A perfect teething toy for your newborn. This mesmerizing maze of the safe, soft and continuous tube is a perfect gift for new coming. With many awards for the design, this toy is the ultimate way to keep your baby entertained for long hours. 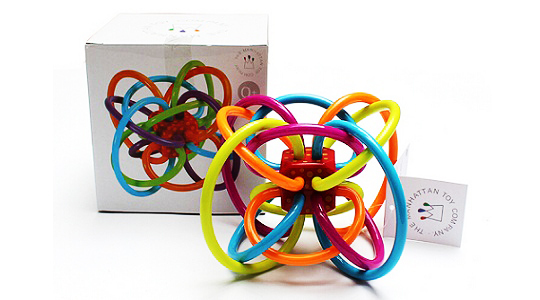 Made using safe, teethable plastic loops and totally BPA free, a Manhattan toy Winkel rattle and sensory teether toy will give your baby a full joy and satisfaction. It's a Time-Honored Classic 'The Winkel rattle and teether', by Manhatten toy is an award-winning classic, a true 'must have' toy for parents and infants with utmost safety considered design. The mesmerizing loop design and lightweight construction make it very easy to grab and play and has a much longer lifespan.